Hello! Monday Malarkey turned to Tuesday Twaddle because of an evening of painting at the new house. Oddly, she left that headboard in the garage. 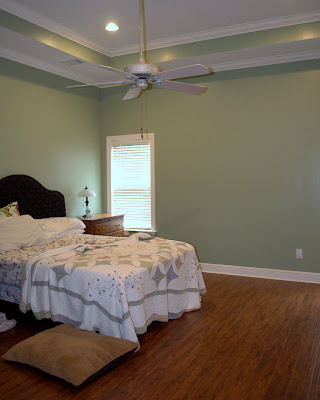 I'm actually quite fond of green, but I prefer a neutral color in my bedroom so I can change bedspread/quilt colors without having to paint, again. Plus, I had a different color scheme in mind. We have to buy new linens because we are finally getting a new bed, after 29 years on the same old mattress and box springs. Woot! I am so ready for a new mattress!!! I'll show you the color I settled on, when the room is all painted and put together. Kiddo got the keys to his apartment in Oxford and took a load of his possessions, including his bed (without the frame), this weekend. He then came home and agreed with his father that they should put a twin mattress and box springs on his full-size frame, in spite of my noisy protests. Kiddo sat on the bed and promptly broke one of the slats. I have been heckling my husband the engineer about how he should have known the amount of stress would not have been spread as evenly over the slats and breakage was a likelihood. He responded that he's a better manager than engineer. Haha. Isabel has been sick, again!! Can you believe it? I don't know if she didn't get enough antibiotic or she's got something new, but she was sluggish all weekend (but smiling -- seriously, she stayed near me instead of hiding and seemed fairly happy, in spite of being miserable) so I took her to the vet, yesterday, and found that once again she had a fever, this time 104.2. 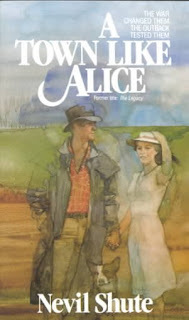 A Town Like Alice by Nevil Shute is a book I read for my Face to Face book group, although I didn't make it to the meeting because I got the meeting week wrong in my head and had only managed 100 pages by meeting time. It's about a woman named Jean who was captured during WWII in Malaya and marched around the country with a number of other women and someone else's baby till Jean manages to find them a place to sit out the rest of the war, working the rice paddies and dressing like the natives. She recounts her story after finding out she's inherited a large sum of money. During her imprisonment, she met an Australian man who tried to help them and was killed for his efforts. Or, so she thought. It's a war story, a romance, a story of one incredible woman's strength. Although A Town Like Alice is fiction, it's based on a true story. If you haven't read it, grab a copy. You will absolutely love Jean. She's tough but kind, savvy but a woman who uses her abilities to help everyone, not just herself. Excellent, excellent book -- copyrighted in 1950 and no wonder it's still around. Highly recommended in a very pushy way, with fireworks and dancing. I've got a pending post of quotations to which I'll add my favorite bit from A Town Like Alice. 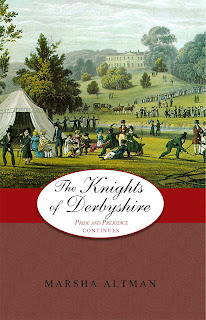 The Knights of Derbyshire by Marsha Altman is, I think, the fifth in her Pride & Prejudice spin-off series -- the only series of its kind that I have become addicted to. Seriously addicted. I absolutely love Altman's adventurous, witty tales. In The Knights of Derbyshire, the Darcy's eldest son, Geoffrey, becomes the victim of dangerous men. Will he survive? Meanwhile, George Wickham the Younger rescues his sister from a marriage for her inheritance and is kicked out of Oxford for missing his final exams, then kicked out of his family's house for not happily sharing his inheritance with his mother, Lydia. There is the usual fun, tension, adventure and romance. The Knights of Derbyshire is definitely one of my favorites in this series, so far. You absolutely must read this series in order -- and should, if you have any interest in P & P spin-offs. This entire series is highly recommended. Be advised that Altman has had several different publishers. The Knights of Derbyshire is available through Amazon, as are the rest of her books, beginning with The Darcys and the Bingleys. See my review of The Ballad of Gregoire Darcy for a link to all of my other reviews. There are quite a few small errors in the new book, but I was forewarned by the author and told they will be eliminated. That was 2 months ago, so hopefully things have been fixed by now. The errors didn't get on my nerves; none were huge and I was expecting them. And, what am I reading, now? I'm reading two books, one nonfiction and one fiction. The Aleppo Codex by Matti Friedman, which I got unsolicited from Algonquin Books (I love Algonquin -- the unsolicited books they send are often among my personal favorites). The Aleppo Codex is an adventurous tale of the author's search for the truth about how a book known as the oldest copy of the Bible was smuggled out of Syria and taken to its original home in Jerusalem. My fiction choice is a backlist title: Dreaming in English by Laura Fitzgerald. It's another unsolicited book and it was kind of a satisfice. I wanted to read something light and I had a particular recent arrival in mind, Enchanting Lily. But, guess what? I took Enchanting Lily (and a few other titles) to the new house because I wanted to have some books on hand, in case I got stranded at the house in a thunderstorm. We had big storms popping up daily, for a while. So, when it came time to choose a new title to start reading, the book I wanted was at the new house . . . and I was at home in the old house. I didn't read Dreaming in English when I received it because I read a review advising readers not to skip the first book, Veil of Roses. This time, I looked up Dreaming in English at Goodreads and found different advice: "It stands alone well, but it will totally ruin Veil of Roses, for you." Fine. I never did get around to finding a copy of the first book and Dreaming in English fit my needs, right now. I'm enjoying both books -- reading slowly, of course, since we're still packing and painting and all that, but when I sit down to read I'm immediately swept away, regardless of which book I'm in the mood for. We have been asked to rent our house out to someone who works with my husband (temporarily) by September 1. Oh, dear. I thought we'd have a bit more time to get the place cleaned up thoroughly. The fellow who asked is going through a divorce and he's tired of staying in a hotel. So, we're probably going to say yes, just to be kind to him. If necessary, I'll take a blogging break but as long as I can keep up with two posts a week, I will. I bet your son is getting excited about school! 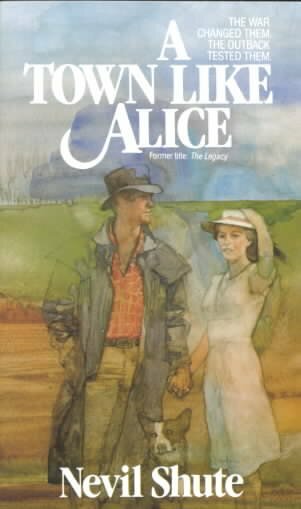 A Town Like Alice remains the only Nevil Shute book I have read. I should at least read On the Beach! I just read On the Beach, recently. Definitely, you should go for it. It's very thought-provoking. A Town Like Alice is one of my all-time favorite reads! !Don't forget to watch the long 6 hour mini-series with Bryan Brown by the same name, It is outstanding. I love, love, love both the book and the min-series and make it a ritual to do read/watch both every few years. Don't tempt me to do it now - - a small vacay and starting back to school will take up too much time, but oh, the temptation. Funny thing, I am ready to listen to the Laura Fitzgerald book as we speak. Reading your post I think maybe I should go find my Veil of Roses and read that first. But audios are a great help when painting....who knows. I hadn't even thought to check. Thanks for the update. I was smiling at the painting escapades. We are up to our necks in it ourselves and painting our library/living room a similar shade of blue too!! I went o rent a car today, having finished another layer and laughed when I saw myself in the mirror. Paint splotches right in the middle of my forehead!! Oops. Oh, thanks, Gaye. I looked at Amazon to see what they have and couldn't figure out which was the movie and which the mini-series but it looks like only one is available. I'll look for Bryan Brown. I've never seen either movie or mini-series and I'm new to the book. It is truly an amazing story. Well, I'll tell ya . . . if you have Veil of Roses, you do need to read it, first. Whoever made that comment at Goodreads was correct. She pretty much tells you everything that happens in the first book in Dreaming in English -- or, at least, near as I can tell. I don't feel like I missed anything. I kind of like the green color- my house is all cream and white which gets kinda boring. But if it doesn't go with your decor, I understand why you're changing it! I like the green, too. Our new house is ridiculously colorful. We have a red entry and dining room, yellow kitchen and hallways, yellow and ochre den (ugh), blue and green bathrooms, 2 brown bedrooms and the blue room that used to be pink. It's a bit much. We're leaving that green in the master bathroom, though. I just didn't want to have to change the color scheme I'd visualized for our new bedroom. A Town Like Alice seems to be a much-beloved book! Very cool that your mother had the same copy! I really like that cover. I got my copy last year and was really excited when my F2F group selected it. Too bad I missed the discussion. I need to read more Shute, too. I've loved both of the books I've read by him. I will be interested in seeing what the bedroom looks like when you are done, and I'm so sorry that your beautiful little kitty was so sick. I am glad though, that she got her meds and is feeling fine again. I also wanted to mention that I own a lot of Pride and Prejudice spin-offs, and I think I have the first in the series that you mentioned, so I am going to have to check it out soon! Great post today! Oh, definitely check out The Darcys and the Bingleys if you have a copy! There are 5 books, now, but she has written 10. Plenty more are coming!!! And, they're so fun. There was one I didn't like as much as the rest but I've enjoyed them all. So much good stuff here, Nancyroo! Can't wait to see more pics of the house as you all transform it. Love your hub's comments about being a better manager. Glad the kitteh is feeling better. And I now want to read A Town Like Alice. Woohoo! Thanks! The bedroom is slowly changing colors - just got back from a little work on the house (although my job was covering up the blue spatters and other detail in the library). Hoping we'll finish the master bedroom this weekend. The bed should be coming soon! Woot! Oh, yes, you must read A Town Like Alice. It is a wonderful read. I'm looking forward to seeing the finished bedroom; you're inspiring me to paint, as our upstairs has not been painted in 10 years although it sorely needs it now. Love that you're getting a new mattress: we just bought a sleep number for my husband who's developed osteo-arthritis in his need. It's great! So happy for your new move, and love the darling kitty pictures int he post above. I love being an inspiration. :) We're actually having a great time painting but I hated painting in our old house because we had so much stuff there was no place to move everything if you needed to paint a room! 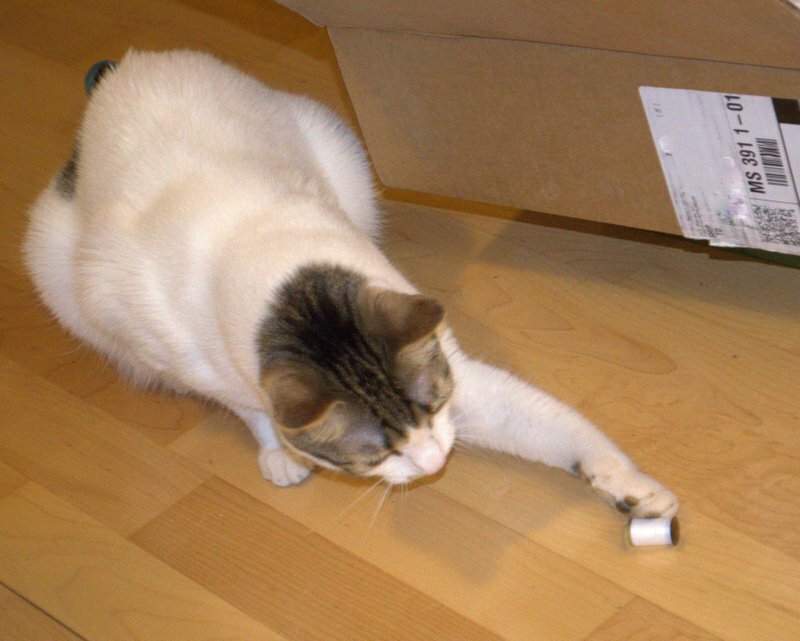 We'll do some painting in it, now that it's emptying, before we sell -- or rent, or whatever. Huzzybuns works with a fellow who is going through a divorce and has asked us to sell or rent to him. You're welcome! Hope you enjoy the book as much as I did. You'll love the author, I think. He's so humble. I'm kind of surprised I've continued to find the time to mail things, too. I thought by now I'd have my Paperback Swap account shut down, but I still haven't put myself on vacation. Husband wants to get moved as quickly as possible, now, so I might have to do that soon. We shall see. The master bedroom is looking great. One more coat and then touch-ups and we should be able to put together the bed frame. The mattress should arrive this week. I'm so excited about getting a new bed! Little Princes is such a great book! I think you'll enjoy it as much as Nancy and I did. Nancy, I've been meaning to read read A Town Like Alice for years. I have Pastoral (also by Shute) on my shelves, but haven't gotten around to it...yet. Maybe if I get a copy and throw it on top of one of my stacks, I'll get to it more quickly. Or maybe Bellezza would like to join me in a buddy read? Of course I don't mind! Ohh, so awful about your mattress. They're such an investment. I think I'd be really upset if I got one home and decided it wasn't right. So far, I'm loving ours. You should definitely buddy read A Town Like Alice with Bellezza!! !